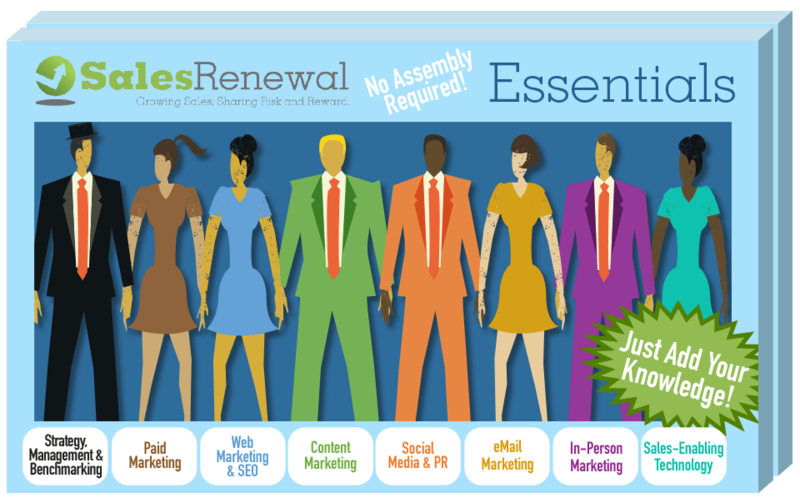 What is Included in the Marketing Essentials Solution™? Marketing Essentials is ideal for businesses that want to improve their sales & marketing scope and effectiveness and want to learn and become proficient—through hands on experience and weekly guidance from experts—in the marketing tactics that work best for them. It is a comprehensive, easy-to-adopt, fixed-fee solution that first improves your marketing & technology assets and then provides the ongoing, active assistance your business needs to cost effectively grow its leads. Guided Marketing Program through coaching and instruction provided by a dedicated Marketing Advisor during weekly coaching & training sessions. Provided Technologies & Tools such as ROI-focused analytics, trackable phone numbers and site backup. On your behalf, Sales Renewal works with SEO experts to set up and manage an inbound link building program: a critical factor in how search engines rank your website. On your behalf, Sales Renewal works with Google, Microsoft, and/or Yahoo advertising experts to set up, manage and optimize an online advertising campaign designed to drive targeted traffic to your website. An actionable growth plan based on an assessment of your current sales and marketing positioning and activities. 5 hours is included for Sales Renewal to implement the website improvements identified in your Blueprint. We will set up a Local Marketing account to create consistent business description on 50+ of the major, local listing sites that also allows you to monitor, from a single location, customer reviews on all of them. The Marketing Essentials Solution is a traditional fee-for-service program (different than the JointSourcing Solution™ shared risk and reward), where you pay a set fee each month during the six-month trial. Many companies like this approach because, on day one, they know what each month’s expense will be. For all the services, people and tools described above, the fixed monthly fee is only $2500 and is as all-inclusive as is possible. In fact, the only fees not included are the ones that are up to you: the direct advertising costs paid to Google Adwords and MailChimp email costs, which vary based on the size of your existing email list. The actual and (perhaps more important) opportunity costs of you doing and managing all of this on your own. The Marketing Essentials Solution is a traditional fee-for-service program (different than theJointSourcing Solution™ shared risk and reward), where you pay a set fee each month during the six-month trial. Many companies like this approach because, on day one, they know what each month’s expense will be. Is Marketing Essentials Right for My Business? Contact us for a free consultation or give us a call at 855-218-3164 ext. 0. Keep track of your marketing activities. Includes monthly analytics report, website trend report, lead report, visitor log and incoming phone calls.